The biggest U.S. banks reported first-quarter earnings this past week, and their tone was uniformly optimistic. While there’s been no shortage of commentators and prognosticators forecasting a looming economic recession, big banks’ leaders told investors they see no signs of one on the near horizon. Executives from (BAC) (BAC) and (USB) (USB) both called the U.S. economy “solid” on their earnings calls. Not surprisingly, the index is starting to look a little stretched in recent sessions, and with it has come a quite violent dispersion in sector performance. The former has also been destabilized by talk of Medicare for All in the “pre-primary promise” season, which has led to a surprisingly swift decline given the overall environment, taking the sector’s relative performance down to a six-year low against the SPX index. April 18: The economy is doing just fine, according to recent earnings reports out of some of the nation’s largest banks. Investors have embraced a range of defensive strategies, from low-volatility funds to defensive growth stocks to old-fashioned cash. Buyer beware. The S&P 500 did very little during the trading week, as Friday was a holiday. The volume is very low, and of course we are in the middle of earnings season. Beyond that we are at the top of the market, and of course there is a lot of resistance above. The S&P 500 fell slightly during the Thursday session and then turned around to recover the losses. Obviously with Friday being Good Friday, the underlying index wasn’t trading. Forget Tiger Woods. On Wall Street, Bill Ackman is attempting a comeback for the ages — perhaps by reverting to investing basics. The stock market is risky—even when it is going in the right direction. Investors were reminded of that during the fourth quarter of 2018, when the Dow Jones Industrial Average and S&P 500 nearly suffered full-blown bear markets. Portfolio managers measure the “value at risk” of their portfolios, using recent volatility to calculate the loses they might sustain in a pullback. A strong dollar has weighed on gold prices. An ETF strategist lays out the case to swap the precious metal for China A-Shares and energy stocks. For investors, though, it’s a dream come true. 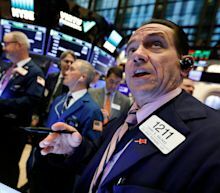 The Dow Jones Industrial Average gained 147.24 points, or 0.6%, to close at 26,559.54, while the S&P 500 dipped 0.1% to 2905.03, and the Nasdaq Composite advanced 0.2% to 7998.06. Fears of a looming recession induced panic-selling in December and left investors wondering what had happened. Under Armour Inc.'s North American president, Jason LaRose, will step down from his role effective April 30, 2019, the athletic company announced in a filing. Patrik Frisk, Under Armour's chief operating officer, will head up the North American business on an interim basis. Under Armour is scheduled to announce first-quarter earnings on May 2 before the opening bell. Under Armour shares have gained 8.2% over the last three months roughly in line with the S&P 500 index , which is up 8.8% for the period. Cannabis retailer MedMen Enterprises Inc. said Friday it has accepted the resignations of two senior officials. The company said Chief Operating Officer Ben Cook and General Counsel Lisa Sergi who is also a board member, have both resigned from the company. It said it named Ryan Lissak as chief technology officer during its fiscal quarter ended March 30. "The leaders of the operations group will now report directly to the CEO," the company said in a statement. "The leaders of the legal team include Dan Edwards, who will continue in his role of Senior Vice President of Legal Affairs, and report directly to the CEO." MedMen is currently the subject of a lawsuit from its former finance head James Parker, alleging that he was exposed to racial, homophobic and misogynistic epithets and slurs, drug and alcohol abuse and personal humiliation, while at the company.The company has denied all wrongdoing. In March, it was expelled from the New York Medical Cannabis Association over the allegations. Shares have gained 7% in the year to date, while the S&P 500 has gained 16%. U.S. equity funds tracked by EPFR Global took in new money during the week ending April 17, to post the first consecutive weekly inflows since early September. EPFR, a subsidiary of London-based Informa PLC , said the two-week streak coincided with the first consecutive weekly inflows into China equity funds on two months, which may be an indication that investors are banking on hope the two countries will reach a trade agreement. During those two weeks, the S&P 500 has gained 0.9% and the iShares China Large-Cap ETF has advanced 1.3%. Overall, however, EPFR said the global rotation out of equities into bonds continued, as equity funds had outflows of $1.1 billion in the latest week, led by redemptions in developed-markets equity funds, while bond funds took in $7.9 billion. Earnings season shifts into a higher gear in the week ahead, as investors also watch for fresh economic data that could show that the economy is pulling out of a temporary rut. Tonix Pharmaceuticals Holding Corp. disclosed Friday that the U.S. Army Medical Material Development Activity (USAMMDA) is exercising its right to "terminate without cause" the research and development agreement with the company. The termination of the agreement, which Tonix and USAMMDA entered in December 2015, is effective April 29. Tonix has two development programs focused on post-traumatic stress disorder (PTSD), and is currently enrolling participants in a phase 3 trial. The stock has gained 8.2% year to date, but has plunged 93% over the past 12 months, while the S&P 500 has gained 16% year to date and advanced 7.9% the past year. Fastly Inc. has filed Friday for an initial public offering of class A shares. The "edge cloud" platform company, which allows developers to deliver digital experiences "at the edge of the internet," hasn't determined the number of shares it will sell. Fastly will have a dual class share structure, with class A shares entitled to one vote and class B shares entitled to 10 votes. The company has applied to have its class A shares listed on the New York Stock Exchange, under the ticker symbol "FSLY." Fastly recorded a net loss of $30.9 million on revenue of $144.6 million in 2018, after a loss of $32.5 million on revenue of $104.9 million in 2017. The lead underwriters of the IPO are BofA Merrill Lynch, Citigroup and Credit Suisse. The company is looking to go public at a time that the Renaissance IPO ETF has rallied 29% year to date and the S&P 500 has gained 16%.